This week, the OECD released its Economic Outlook for November 2015, revising 2016 real GDP growth in the OECD area downward from 2.5% to 2.2%, following its June 2015 report. The OECD noted a collapse in import volumes in emerging markets (especially China), and the sort of slowdown in global trade growth that has historically accompanied recessions. 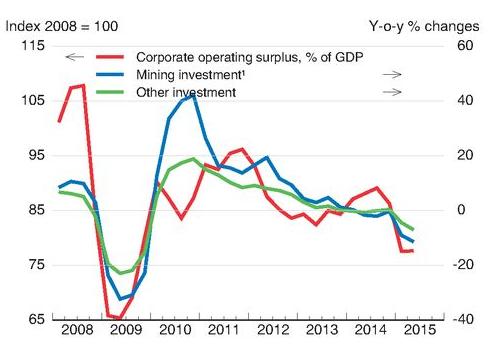 Real fixed investment was again disappointing, and the OECD once more pleaded with countries to take advantage of low interest rates and increase public infrastructure investment, in part to tackle climate change. 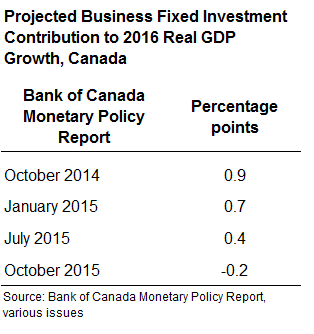 Source: OECD Economic Outlook November 2015, p. 95. Meanwhile, the ILO released a review of IMF country reports and government spending projections for over 180 countries. It anticipates a second phase of austerity beginning in 2016 and lasting at least until 2020 and affecting 132 states — more than two out of every three countries worldwide, mostly in the developing world. By the end of this phase, the ILO projects that austerity will have an impact on over 6.1 billion persons or nearly 80 per cent of the global population. Austerity programs are expected to include the reduction or elimination of food and fuel subsidies, public-sector wage freezes and cuts, further tightening of safety-net supports, erosion of health and pension benefits, and labour market reforms. If this in itself wasn’t enough to ring alarm bells, on the eve of the COP21 negotiations in Paris, the World Bank released a report forecasting that climate change alone could force more than 100 million people into extreme poverty in the next 15 years.